Released in July of 2015, the Samsung Galaxy Tab E 9.6 sports some new features including a non-slip fabric-style rear casing that enables a better grip while holding the tablet. In this article, we take a look at Samsung Galaxy Tab E 9.6 mounts for your car or home use. The Galaxy Tab E 9.6 has a unique shape. Not quite as large as a full size tablet but a little larger than a midsize tablet. Somewhat similar in size to an Apple iPad Air. While this unique shape brings some challenges to finding the proper mount, there are still a lot of choices available. This tablet measures 241.9 x 149.5 x 8.5 mm (9.52 x 5.89 x 0.33 in) and weighs a little more than a pound. If adding a case or skin (which we always recommend), this will make the tablet larger than the default measurements so be sure to check these measurements before shopping for your Samsung Galaxy Tab E 9.6 mounts. The photo that accompanies this article is the Arkon Extendable Large Tablet Suction Cup Mount. It will fit your Samsung Galaxy Tab E 9.6 with or without a case or skin. The cradle is spring-loaded and expands to fit your tablet with or without a case or skin. A tablet is a large device so you need a mount that not only has the right cradle size, but also comes with a mount that has an arm that is long enough to clear a sloped car windshield. The mount itself has a metal arm that can extend from 14.5 to 18.5 inches. The cradle rotates 360 degrees so your tablet can be in portrait or landscape mode. Lots of room between the tablet and windshield. The suction cup has a vacuum lock to maintain a secure connection. The metal arm will keep the tablet very steady in normal environments. Be sure that you can use your windshield as a mounting point as a few states including California do not allow this. Today, you can find seat bolt mounts for virtually any device. I have used these mounts for many years and like them a lot. 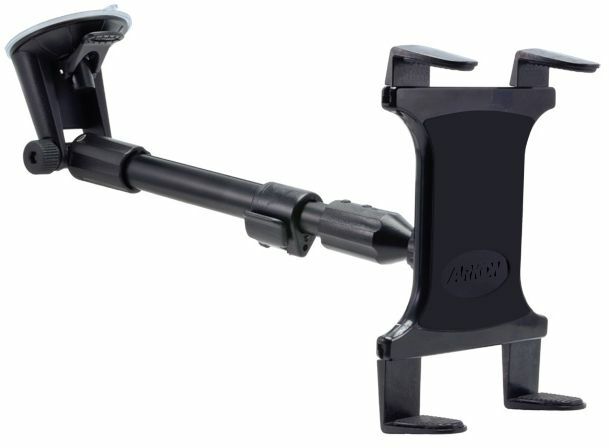 The Arkon Car Seat Bolt Floor Mount for Tablets uses the same cradle as the prior mount. The mount has a hook on the bottom that fits under the seat bolt. Installation is easy and takes five minutes. Be sure to use a wrench or pliers when installing these. Don’t hand tighten the bolt. Use the wrench or pliers because it needs to be completely tight to ensure the weight of the tablet doesn’t compromise the mount. The mount itself is made of metal and is flexible so when your tablet isn’t in the mount, it can be bent out of the way so a passenger can sit without a problem. A spare cup holder makes a great place to mount a Samsung Galaxy Tab E 9.6. If your cup holder is smaller than a 7-Eleven Big Gulp, most cup holder bases will fit fine. The iKross Tablet and Cell Phone Cup Holder Mount is an excellent choice for this purpose. There are a some excellent advantages to this mount. It comes with two cradles. One to fit your tablet and a smaller cradle to fit your phone. The tablet holder expands from 7 to 10.2 inches. The cradle can swivel 360 degrees into either orientation. The mount has a 10-inch arm that can be adjusted at the base and tip. These fit cup holders to 3.75 inches. For home use, the CTA Digital Floor Stand for Tablets is an adjustable mount with an expandable holder. A hands-free home mount is useful if using your tablet in the kitchen for recipes, living room for video conferencing or bedroom for watching videos. This beats laying down with the tablet sitting upright on your chest. This stand includes an adjustable cradle that opens from 6 to 8 inches which means that you will hold your tablet from the short sides (landscape). The cradle can rotate so you can use it in landscape or portrait mode. The overall height is adjustable from approximately 3.5 to 4.6 feet with a flexible 15 inch steel gooseneck. This is going to fit the 9.7″ tablet real well and the smaller 8.0″ if it has a thick case or skin. A closing word on protection for your Samsung Galaxy Tab E tablet. Buy a good case or skin. It’s worth the money as it will protect your tablet from drops. All of the mounts mentioned in this article use a universal holder which means that your tablet will fit with or without a case or skin.